What are causes in Human IQ reduction? The more society develops, the better people are eating. 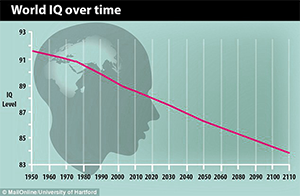 However, IQ have been steadily falling for the past few decades, a new study by The Centre for Economic Research points out. Norwegian researchers found out a steady decline among those born after 1975 which is equivalent to about 7 points each generation. The IQ of Norwegian people is lower than that of their father when they are the same age. Similar studies in Denmark, Britain, France, the Netherlands, Finland and Estonia have demonstrated a similar downward trend in IQ scores. The IQ scores drop marks the end of "Flynn effect". In which, IQ scores slowly increase in the first half of the last century. It is paradoxical that with the advancement of technology, artificial intelligence is becoming smarter, people are more stupid. The researchers believe that environmental factors are what's driving the decline in IQ scores. These environmental factors could include changes in the education system and media environment, nutrition, reading less and being online more. Although an intelligence quotient (IQ) is just one of many aspects related to our ability and potential it is a figure that receives a lot of attention. Here are some interesting things about IQ. Although it is difficult to accurately measure human intelligence, scientists have demonstrated several factors that affect IQ. Intelligence is heritable, and researchers assumed that people with high IQ scores would have kids who also scored above average. The study looked at the IQ scores of brothers who were born in the same family. Researchers found that IQ score of the eldest is 3 points higher than that of the younger. You have trouble in sleeping, research shows that people with high IQ scores tend to stay up late than others. Don't be too upset when your parents make you learn piano. A lot of evidence shows that playing piano can increase memory and brain development. People with high IQ scores like to drink alcohol and use stimulants. It seems that smart people don't always make the right decisions.